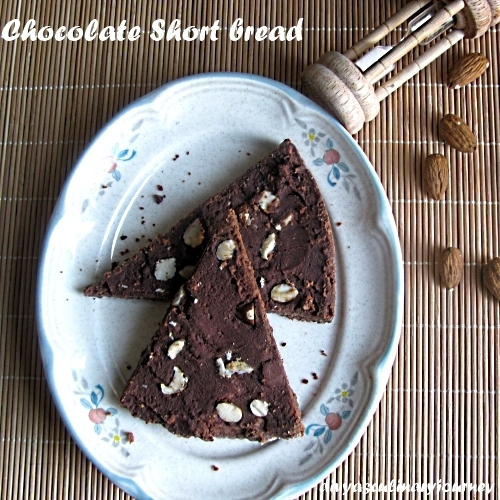 Today I am posting Chocolate Shortbread. The recipe is from Joy of baking. The shortbread was absolutely delicious with buttery rich taste and the chocolate glaze with nuts sprinkled on top. Preheat the oven to 350 F. Prepare the tart pan with removable bottom by applying butter. Set it aside. In a bowl sift and whisk together all purpose flour, cocoa powder and salt. In a bowl cream together butter and sugar then beat in egg yolk and vanilla extract. Add flour mixture to this mixture and mix till the dough is formed. Press the dough evenly in the bottom of the prepared tart pan. Bake for 20- 25 minutes until its done. Remove and let it cool. In a microwave safe bowl mix chocolate chips and butter and microwave in defrost mode for 30 seconds. Stir well and microwave for another 30 seconds. Continue till the chocolate is fully melted. Prepare this glaze while the shortbread is still baking. Then while it is still hot pour the glaze on top of it and evenly spread them on the shortbread. Then sprinkle the chopped nuts on the glaze. Let the shortbread cool completely. Now remove from the tart pan and slice and serve them. Super addictive shortbreads, feel like grabbing some. Looks so chocolaty and delicious..
delicious.......its chocolate and its divine.